During 2018 Thomas Chippendale and his legacy are being celebrated as widely as possible, both by encouraging greater public awareness of his genius and the glories of 18th century craftsmanship, and by demonstrating how the same spirit animates today’s designers and makers. The Chippendale 300: 1718 – 2018: A celebration of Britain’s greatest furniture maker project has formed partnerships with institutions and historic houses across the country and created a programme of exhibitions and events to celebrate Thomas Chippendale’s tercentenary. Highlights include an exhibition at Leeds City Museum, co-curated by our own Adam Bowett, and James Lomax, Curator of the Chippendale Society: Thomas Chippendale: A Celebration of Craftsmanship and Design, 1718-2018 (9 February – 9 June 2018, Leeds City Museum). Adam will be offering RFS members a guided tour of the exhibition in March (see the Events page for how to book). Members will be interested to hear about Take a Seat! An exhibition of Lincolnshire craftsman-made chairs which will be held at Louth Museum from 13th September to 28th October 2017. The extraordinary history of chairmaking at the beginning of the nineteenth century in Lincolnshire has only recently been revealed by vernacular furniture historian and long standing member of the RFS, William Sergeant. He has shown that the scale of windsor chair manufacture was unique in the UK and was far greater than was previously thought. 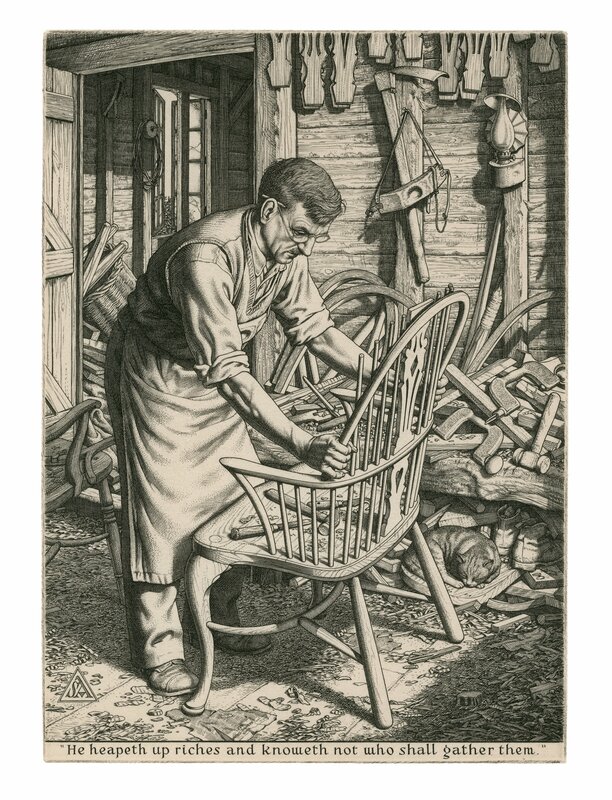 During this period hundreds of thousands of chairs were made in workshops in Grantham, Sleaford, Boston, and then later in Stamford and Bourne. They were distributed and sold all over the Midlands and the North. Their style is distinct to the county and examples can still be found today in good condition, in auctions and antique shops. Previous to this, in the eighteenth century, the simple rush seated ladderback chair had superseded the stool in country households. Lincolnshire produced large numbers of these chairs, with the centre of manufacture around Louth, Spilsby and Alford, extending later to Boston and Spalding. It is rare for good examples to have survived to the present day. William Sergeant has been collecting and researching Lincolnshire’s chairs and is recognised as the country’s leading authority on the subject. On the evening of Tuesday 10th October he will be giving a talk on the subject, and on Saturday 14th October there will be an open day chair surgery: the aim of which is to try and find well provenanced local chairs, in the hope of establishing exactly which patterns were made in the towns of Spilsby, Alford, Caistor and Louth. 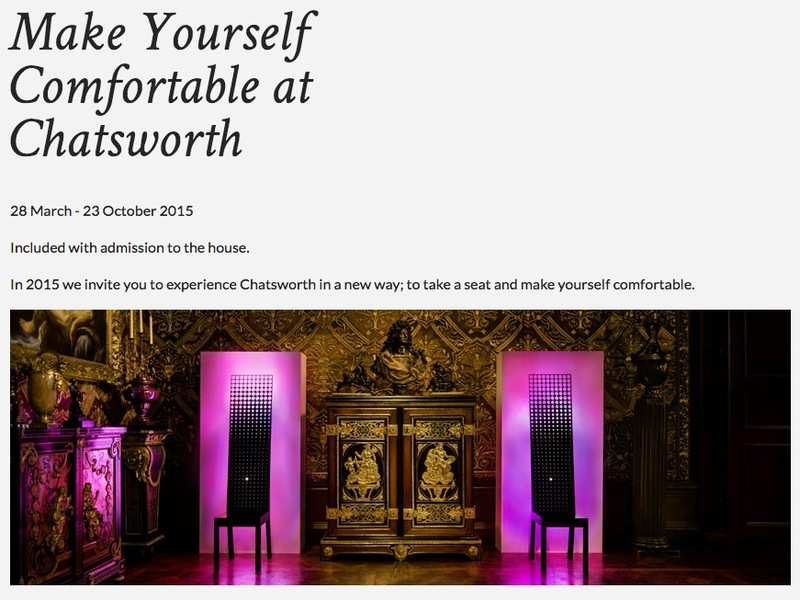 Chatsworth is “turning to contemporary furniture designers to provide a completely different experience for our visitors”. A number of works have been specially commissioned for the exhibition by established and emerging designers including a collaboration with students at Sheffield Hallam University. There is also an opportunity to join the curator, Hannah Obee, for a Make Yourself Comfortable tour on 24 April and 26 June.